RockSea is a resort for lovers of simplicity, who can nonetheless appreciate the availability of electricity during the evening, two sets of both women & men’s shared bathrooms and a delicious and healthy menu. With 20 straw huts and wooden bungalows spread over a vast 400 m stretch of rocky cliffs and coral beach, RockSea is open for all guests. Here, luxury has a different meaning. The camp is equipped with everything essential for living. Not more. Nothing should disturb the perception of the essentials. Starry night, desert winds and the sound of the sea. is a round, 50 m2 big tent, which gives protection from sun and wind and is located at the northern end of RockSea right at the shore with magnificent view at the Saudi Arabia mountain range. If you are interested in offering a seminar or workshop, please contact us in advance, so we can make individual preparations and arrangements. Either dancing or music, yoga, presentations, meditation or role plays... we will try to fulfil your wishes and needs in the best way possible. It is also possible to book an extra self-service kitchen for groups, who would like to be more independent. Please contact us for more detail. We are looking in longterm for a experienced allrounder for overall maintenance. For example in the fields of woodwork, building, plumbing, electric, cars and other handcrafts. We offer a local salary, free food, accommodation and a magnificent working area in an familiar atmosphere. If you are interested feel free to contact us by email with a CV. Are you young (18+), or a little older, intrigued by other cultures and do you have interest and time to collect new experiences in another country? 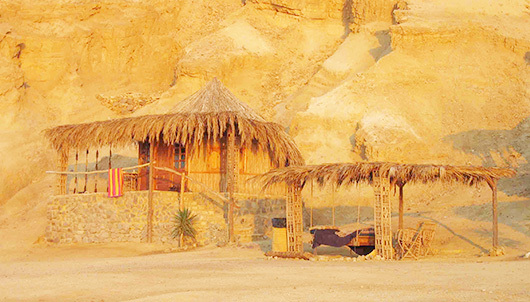 Then maybe volunteering at RockSea Resort in the eastcoast of Sinai could be the right thing for you. We are constantly looking for people, who like to work hard, sharing some time (min. 1 month, max 3 months) with us in our camp for free accomodation and food. Volunteers that have any craft skills, or are practically minded are more than welcome, we sometimes also need other workers for cleaning, kitchen, restaurant and in other general areas of work. The Red Sea with its beautiful corals and diversity of fish is our “garden”. It’s possible to swim and snorkel right in front of our camp. It is also possible to dive, we can arrange dives in various places through a diving center in Nuweiba. Desert trips by camel or by jeep are a must for everyone who would like to experience the special atmosphere and impressive surrounding. We can organize day-trips or longer tours to various places such as the Colored Canyon, White Canyon, Ain Khudra, Wishwashy etc. The famous St. Catherine's Monastery lies on the foot of Gabal Catharina, which rises up to 2637 m. Founded in the 4th century from hermits, the arrangement was extended constantly during the following centuries. The monastery is in the possession of some of the most important biblical manuscripts of the world. Particularly the climbing of the enclosed Mount Moses for sunrise or sunset is a unique experience. 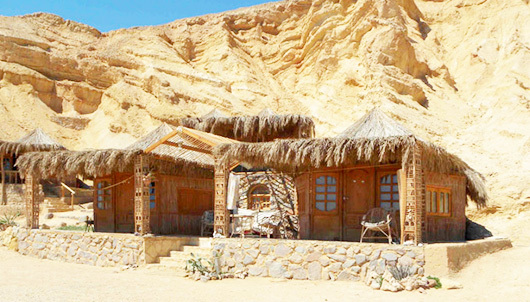 The monastery can be reached from our camp by taxi or car and bedouin guides will lead you the way up to Mount Moses. 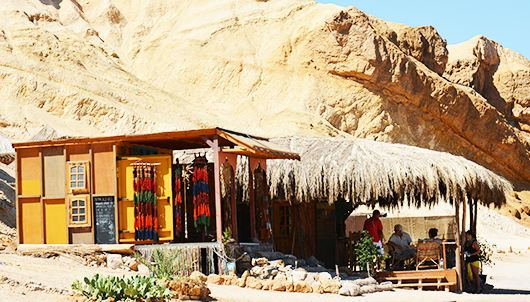 The camp has a little Bazar offering self-made jewelry, clothes, towels, sunglasses, carpets, herbs, etc. 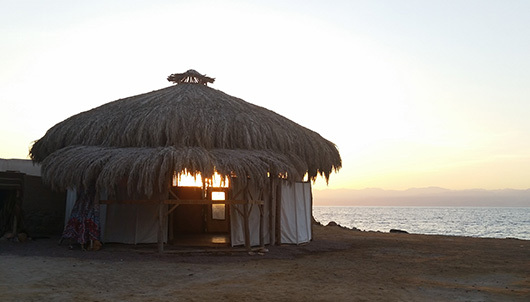 It is also possible to visit the cities Nuweiba (10min. 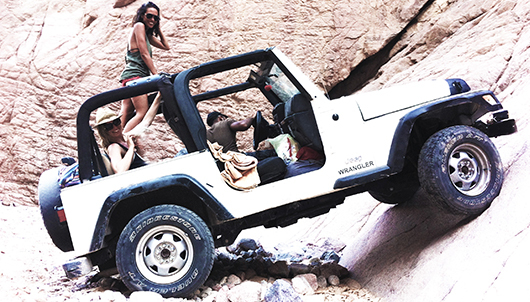 drive) and Dahab (1h drive) for shopping tours. 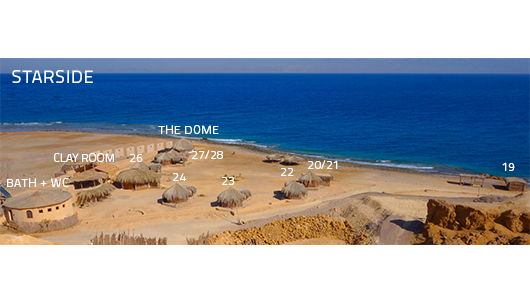 The Dome is a round, 50 m2 big tent, which is protected from the sun and wind by a palm leaf roof, has a wooden floor and is located at the northern end of RockSea. 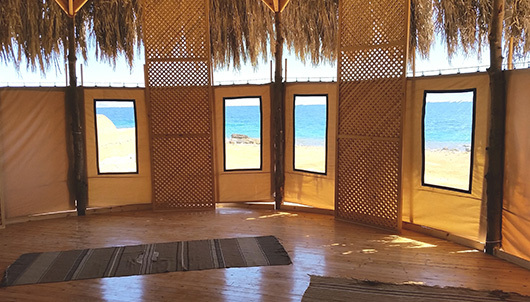 The dome can be used as a space for seminars and workshops, as well as for private usage for dancing, music, yoga, presentations, meditation, role plays, etc. If you are interested in offering a seminar or workshop, please contact us in advance, so we can make individual preparations and arrangements. It is also possible to book an extra self-service kitchen and dining room for groups, which would like to be more independent. Please contact us for more details. Our camp lies approx. 400m between a hill and the sea. 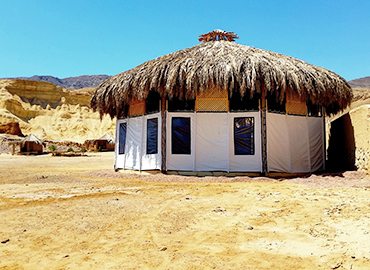 It includes 17 bungalows, 5 huts, a new clay building; 2 shared bathrooms; some comfortable Arishas (shadow places) as well as a Dome and our cafeteria. 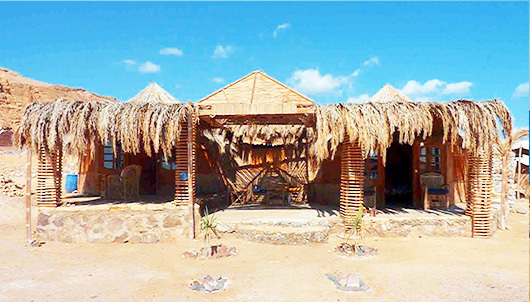 On our Moonside you can find the cafeteria, bungalows & bamboo huts and a set of women and men’s shared bathroom. The bungalows are individually arranged on a sloped hill. They are situated about 30m off the sea and are located closer to the restaurant than the Starside-bungalows. 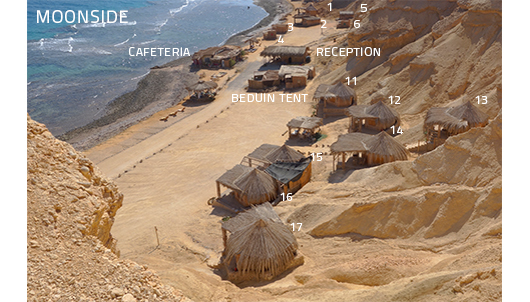 The bamboo huts are situated close to the cafeteria and some are even directly next to the sea. Our Starside accommodates bungalows, the dome as well as the clay building and a set of women and men’s shared bathroom. The bungalows are arranged on a plain area in a semicircle, about 30 m away from the sea. They are closer to the street and further away from the restaurant than the Moonside-bungalows. 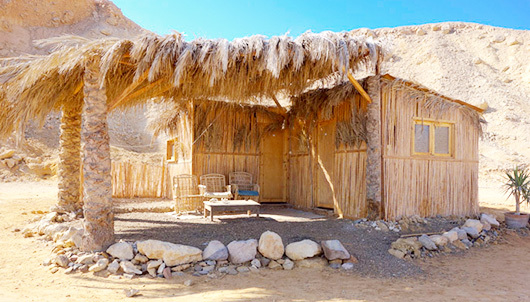 The simple huts are made out of bamboo and are furnished in a basic way with a double mattress, which is directly placed on a carpet on top of gravel, a nightstand, mirror, carpets and electricity during the evening. Each hut has a front porch with chairs and a table. The bungalows are double-walled out of bamboo, reed mats and have a wooden roof with palm leaves. They are furnished more lavishly than the huts and are more spacious (except for the family hut) with a tiled floor, a double bed, generous shelf, carpet, mirror, fan and curtains, electricity during the evening. Each bungalow has a front porch with chairs and a table as well. Our simple huts are built from bamboo and wood and are furnished in a basic way with a double mattress, which is directly placed on a carpet on top of gravel, a nightstand, carpets and electricity during the evening. Each hut has a front porch with chairs and a table. They are situated in the Moonside and are suitable for 1-2 people. Our hut No. 2 is a family hut for 4-6 people, situated on the Moonside. It looks just like a simple hut from the outside only that it’s more spacious and has a larger front porch. It is equipped with two double beds, a convertible sofa bed and shelves and carpets. Our No. 1 - the Bungalow directly at the sea. It’s furnished with a wooden floor, a double bed, generous shelf, a mirror, fan, carpet and curtains, electricity during the evening. This bungalow has a terrace with two chairs and a table. It’s situated directly next to the sea. The bungalows 15+16 are linked by a big terrace and suitable for each 2-3 people with seperate entrances and the usual bungalow equipment. In the rear part of the bungalows, there is a passageway and area for cooking- and washing, which can be rented for an extra cost. This twin bungalow is especially suitable for families or groups of 4-6 people. Our Mountain bungalows are double-walled out of bamboo, reed mats and a have a wooden roof with palm leaves, 12.5 square metres. The bungalows are furnished with a tiled floor, a double bed, generous shelf, carpet, mirror, fan and curtains, electricity during the evening. Each bungalow has a front porch with chairs and a table as well. The equipment is laid out for 2 people. No. 20/21 is composed of two rooms with an own access each. Both are divided by a terrace. Number 20 corresponds in the external and internal rather to that of a hut, however, it is more spacious, has a double bed and is equipped with one more bed/sofa for comfortable sitting or as a sleeping place for a child. Number 21 corresponds to the state of a normal bungalow. Both are suited together for a family or group of up to 6 people. Our bungalows are double-walled out of bamboo, reed mats and wooden roof with palm leaves, 12.5 square metres. The bungalows are furnished with a tiled floor, a double bed, generous shelf, carpet, mirror, fan and curtains, electricity during the evening. Each bungalow has a front porch with chairs and a table as well. The equipment is laid out for 2 people. The numbers 27/28 (picture below) are two bungalows linked by a big terrace for each 2-3 people. In the rear part of the bungalows is an extra space which can be used as storage. Both bungalows dispose of a separate entrance and the usual bungalow equipment. Directly beside 27/28 is our Dome. Our Clay House was completed in the beginning of 2012. We offer one room of our clay house, which is sheltered from the wind and warmer, particularly during the wintertime. Located between the gigantic continents of Africa and Asia, the Sinai peninsula can be compared to an immense triangular wedge. Circumscribed from three sides: in the West by the Suez Canal, in the North by the Mediterranean Sea, and in the North-East by the Israeli border - all together Sinai stretches over more than approx. 61,000 km B2. "Wild scenery and the Red Sea form an impressive scenery of dramatic contrasts." Gravel and grit surfaces pass over into a charming dune scenery. A softly deepened wadi ends in a wildly cleft gulch. In the Eastern Gulf of Aqaba eroded reddish granite mountains from 2000-metre height fall nearly vertically into the deep blue water of the sea. The cool, miraculous clear starry night follows the dusty, glowing midday heat - these impressions and the with the changing light conditions, incomparable contrasts are what makes the fascination of Sinai and become unforgettable experiences. From Taba: We can send one of our Taxis to the Taba/Eilat border to pick you up. Please consider that there is an exit/entrance fee at the border, when entering Egypt. No fees for exiting. From Sharm el Sheikh: We can send one of our taxis to pick you up from the airport. The camp is approx. a 2 hour drive away from Sharm el Sheikh. From Cairo: It is possible to fly from Cairo to Sharm el Sheikh (see egyptair.com, nileair.com). 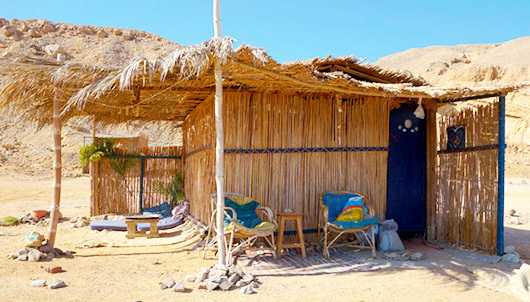 Alternatively, Egyptians may take the East Delta Bus (Direction Nuweiba). The driver is usually willing to make a short stop at the camp (approx. 45 km after Taba, 2 km after Castle Beach, 10 km before Nuweiba, little baksheesh for driver might be helpful). For foreigners travelling by plane is recommended, since the Taba bus-route is closed for non-Egyptians. Alternatively, foreigners may take a bus to Sharm el Sheikh (go-bus.com) and the East Delta Bus from Sharm el Sheikh to Nuweiba. Most Europeans can enter Egypt via Sharm or Cairo for a tourist stay with their ID (and pass photo). The entry with the passport (also to the temporary passport) is easier and quicker. 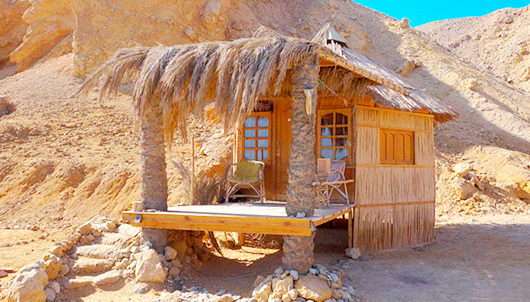 No visa duty exists for a stay up to two weeks on the east coast of Sinai (Nuweiba, Dahab, Sharm el Sheikh). Nevertheless, the visa duty for Egypt continues. The visa (30 days valid) can be acquired with your entry at the airport in Egypt and costs 15$. When entering with a European ID, a special entry card must be filled out at the arrival and be provided with two pass photos. Children under 16 years who still own no passport or identity card can either enter with their child passport or enter with the passport of the parents (from 2 years also with photo). All travel documents must be valid for at least another three months from departure date (of your vacation). It is advisable to make a photocopy of your ID/Passport (best of all of the entry stamp). Vaccinations are not usually prescribed, but beside the revitalization of tetanus and polio vaccinations a hepatitis A vaccination is recommended. Please, in the case of doubt, ask the responsible consular representations and authorities before the departure. - We recommend to pay in Euros. We also accept US Dollars, Egyptian Pounds and Israeli Shekel. 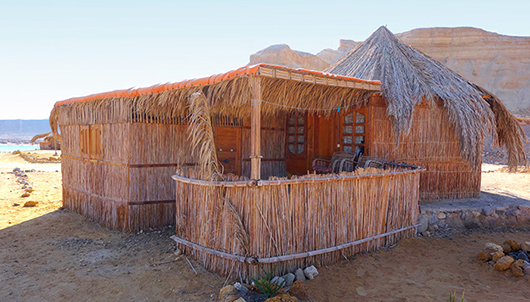 - There are four ATMs in Nuweiba. - Unfortunately, credit card payments or transfers are not possible at our reception. - All our accommodation rates are valid only for a minimum stay of three days! - A stay for one night only will incur an extra charge of 20% (respectively 10% for two nights only). - Solo-travelling women get a special offer of 29,- € for a Starside Bungalow. - We have a 3,00 Euros discount on Starside/3.00 Euros discount on Moonside for children between two and twelve years. Egypt generally has a desert climate and a Mediterranean climate towards the northern part of Egypt. The best holiday season is during the months between September and May. The temperatures then lie between 20 and 33 degrees. 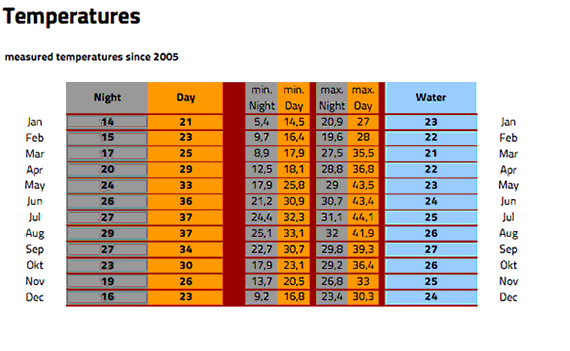 The water temperature is 21C in winter and goes up to 27C during summer. 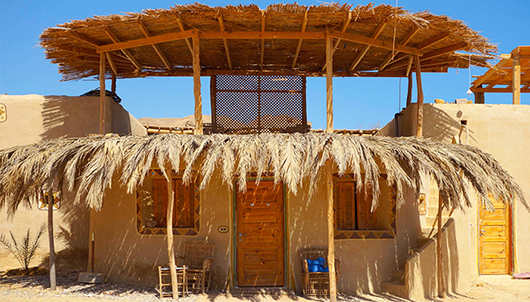 Precipitation in Sinai is very seldom, during the winter months there are some rainy and windy days. Inside the mountains of Sinai winter nights can become rather cool. The summer is to be recommended only partly because of its rather dry heat of sometimes over 40 degrees. - Where can I find favorable flights? You may check for flights on websites such as: flygermania.com, turkishairlines.com, egyptair.com, skyscanner.com, or opodo.de. The closest currently operating airport is Sharm El Sheikh International Airport. - How do I get to the camp? 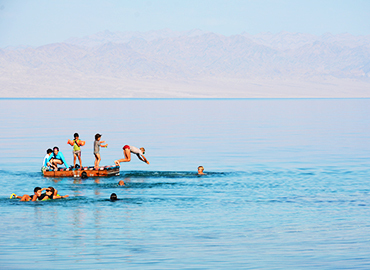 From Taba: We can send one of our Taxis to the Taba/Eilat border to pick you up. Please consider that there is an exit/entrance fee at the border, when entering Egypt. No fees for exiting.
. The camp is approx. a 2 hour drive away from Sharm el Sheikh. From Cairo: It is possible to fly from Cairo to Sharm el Sheikh (see egyptair.com, nileair.com). Alternatively, Egyptians may take the East Delta Bus (Direction Nuweiba). The driver is usually willing to make a short stop at the camp (approx. 45 km after Taba, 2 km after Castle Beach, 10 km before Nuweiba, little baksheesh for driver might be helpful). For foreigners travelling by plane is recommended, since the Taba bus-route is closed for non-Egyptians. Alternatively foreigners may take a bus to Sharm el Sheikh (go-bus.com) and the East Delta Bus from Sharm to Nuweiba. - Do you provide wireless Internet at the camp? Yes, it is possible connect to the internet for a fee of 2.5 Euros/day. - Is it possible to enter Egypt with an ID? It is possible for most Europeans. Please notice that when entering with a European ID, a special entry card must be filled out at the arrival and be provided with two pass photos. The city of Sharm El Sheikh has the biggest airport of Sinai. It has formed a regular tourism industry for all-inclusive tourists. Numerous international hotels, bars, clubs, cafes, and bazaars are located on a beach promenade. Divers can find an impressive underwater world, in particular combined with boat tours and at the Ras Mohammed National Park. The former Bedouin village lies approx. 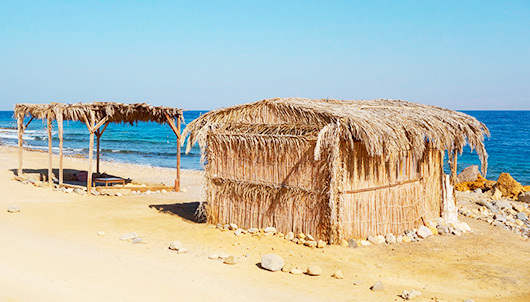 an hour drive away from RockSea on the east coast of Sinai. Many small restaurants and souvenir shops line up on the beach promenade. Bigger hotels are placed in the south near a lagoon. Dahab is famous for its windy weather and is a popular windsurf-, kitesurf- an freedivespot. Several diving centers are located in Dahab. 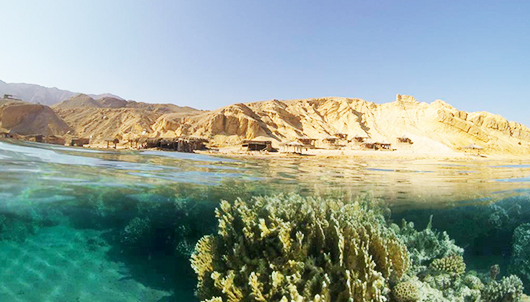 One of Dahab’s biggest attractions is the Blue Hole, a gigantic hole in the reef surrounded by corals. 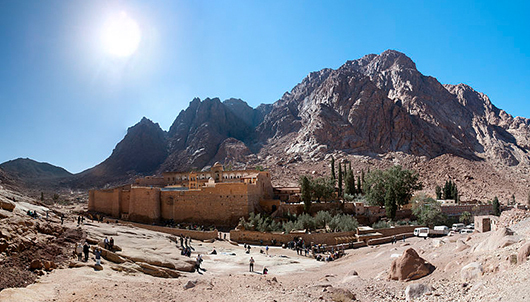 St. Catherine is a village in the heart of South Sinai. It’s famous for the Saint Catherine’s Monastery, which lies on the foot of Gabal Katrina and rises up to 2637 m. Founded in the 4th century by hermits, the arrangement was extended constantly during the following centuries. The monastery is in the possession of some of the most important biblical manuscripts of the world. Particularly the climbing of the enclosed Mount Moses for sunrise or sunset is a unique experience. The monastery can be reached from our camp by taxi or car and Bedouin guides will lead you up to Mount Moses. 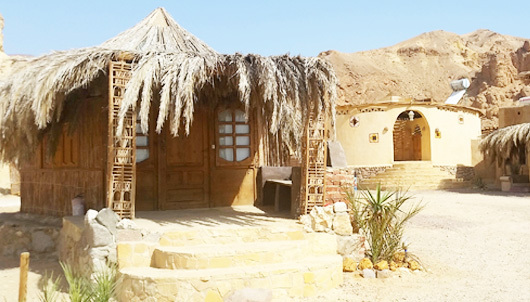 The small city stretches for about 10 km along the Red Sea and can be divided into the Tarabeen Bedouin village, the city, Duna, the port and the Mzeina Bedouin village. There is a cluster of small shops along the city and parts of Tarabeen selling souvenirs and handicrafts. 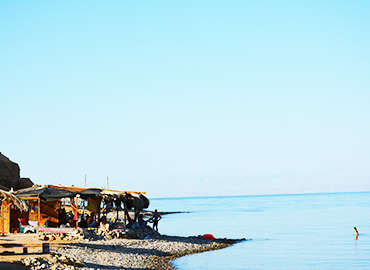 Nuweiba owns a port, where a ferries run regularly to Aqaba, Jordan. "When calling, please consider our office hours from 9-21 clock." To see map, scroll down!